The island of Cyprus lies south of Turkey in the eastern Mediterranean. It was partitioned in 1974 following an invasion of Turkish troups and the ugly no-man's land separates the Turkish-held northern territory from the Cypriot's retained land in the south. However, since 2004, EU citizens are free to cross from one side of the city to the other allowing visitors to enjoy Nicosia as a whole and to get a better understanding of the Cypriot people and a wider appreciation of Cyprus. On the north coast of the island lie the Kyrenia mountains; in the south the Troodos mountains give forth the Pedias and Kariyoti rivers flowing towards the bays of Famagusta and Morphou. Winter is the rainy season and summers are hot and dry with water conservation a priority. Scrublands predominately have replaced former woodlands which remain only in the mountains. Many animals have been overhunted and fishing is poor; resources have been depleted, but crops are still plentyful and vary widely due to local micro-climates. Cyprus was the start of a week's holiday which encompassed a mini Mediterranean cruise with day landings in Israel to visit Bethlehem and Jerusalem, and Egypt to visit the Pyramids at Giza. These short 'cruise tasters' are a special feature from Limassol in Cyprus so, for the sake of 3 days out, it's well worth doing for the 'added value' it gives to a Cyprus vacation if you have not yet visited Israel or Egypt. The tight time schedule does hold-out its disappointments, however, as I will shortly reveal! This was an early holiday, starting on 6th April but, coming from the UK, we did expect hot - or even warm weather. So Hazel and I had attire to meet such expectations. However, our luck with weather for the entire vacation was not particularly good, as you will see. A chilly wind blew most of the time in Cyprus and we, along with many others, were unexpectedly caught out - although, to be fair, the sun did shine most of the time, although the temperature never got high enough for our satisfaction, let alone delight. The rest of the time it rained quite hard! Quite out of character, we were told! But then we know about that sort of thing. We stayed at the Atlantica Hotel in Limassol: all marble corridors and space. This is situated some way out of town along the coast to the east, and we did walk into town and back more than once (ie twice), but most people's feet would object strongly to this - and ours did grumble. So if you do the same, note that there is a good bus service into town, and that the cruising taxi drivers can be bargained with, so agree a fare before you get in and even this option can be reasonable. This coastal road is very wide, very indented, and after rain such as we had, very puddly! The traffic moves fast and erratically in general, and down a road full of water-laden potholes such as this, drivers tend to take the driest route, irrespective of where this takes them car on the road. Do you remember an old video game in the days where things weren't so darned sophisticated where you had to get turtles across a multi-lane highway without them getting splatted? Well, crossing the road here is a bit like that! You had to plot your route across the road between the huge, water-laden potholes, wait until there was nothing on the horizon, then just go for it! With luck you could weave, jump and make your way to the opposite pavement and into some handy bunker before the next car's bow-wave rolled in. Our hotel was located in a side road adjacent to the coastal road. Although there were reasonable dining facilities in the hotel, there were other options nearby. For a simple snack or drink, a small café-bar opposite had some nice outdoor tables, and one day we settled here on day at an outside table, in the sun! Sitting nearby was a very tanned, somewhat elderly man whom we took, on sight, to be a local. How else could he look so well-worn that his skin barely fitted except by toiling, perhaps, on a nearby plot? 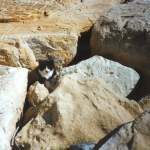 So we got to chat, to get some inside information on Cyprus, only to learn that this splendid fellow was English. Even more surprising was the fact that he was a director of a large company in the UK that made its money from fitting car parts - exhausts, tyres, and the like - and he had turned his back on all of that, and those nasty, smelly automobiles that he served, and spent all his time globe-trotting on his trusty bicycle, sleeping rough in his trusty tent. (Not that he was short of a penny or two, you understand.) He didn't look the type to do the Times crossword in 20 minutes, but I bet he could do it in ten! Sharp wasn't the word. He had ridden his trusty bike extensively over five continents - and had plans to cover the sixth quite shortly. His memory was top-notch. For example, he told us about when he cycled America coast-to-coast, and even told us the precise dates he had been at certain places on the way: several years before! Here was a man with an interesting life and interesting contrasts. As for his business interests, he just phoned from time to time to check it was still surviving. I don't imagine that it would have changed his life-style very much one way or the other. The shore side of the coastal road near our hotel at this point was hidden by buildings except for a few alleys leading to the rocky shoreline which they're clearly not proud of just here - although some cats were. 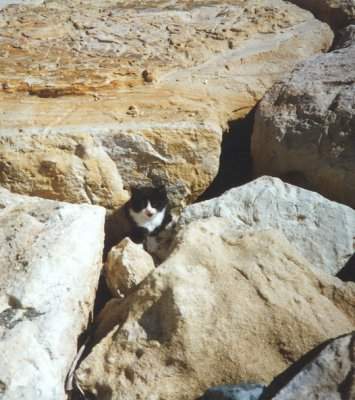 Some charming - but shy and wild - black-and-white kittens peeped up at us from between the rocks and gambled around when they considered it safe, retreating fast when they though it was not, just like rabbits. The town is quite small, and as the previous clue will tell you, nothing to get you greatly inspired. Cyprus is full of gift shops, mainly the usual tourist ***bish, but you can, at least, get mementos of an interesting island. The people of Cyprus are warm, friendly, helpful, and they enjoy a freedom from crime that many of us will envy. Perhaps being on a small island makes it less likely that your car will disappear if you leave it unlocked and unattended, for example, but the word is that you can get away with such things on Cyprus. You really do feels safe here. If there is any trouble, you can generally be sure that it is caused by tourists! (So behave yourselves, folks: they will lock up foreigners!) This inherent trust was exemplified by something I saw at Larnaka Airport. There, in the departure lounge, on a chair, totally unattended for a long while, was a very expensive movie camera, the kind only professionals use. Could you do that in your country? Many people say how beautiful Cyprus is. Perhaps it is because I live in green Dorset, in the UK, that this was not the impression I got. The drab scrubland which populates much of the island - of which I show no pictures - does not have the same beauty as green grass in my opinion but, if you want sun, you can't have everything. (Of course America can prove that wrong by spraying on new grass, as in Palm Springs! But that's another story in these pages.) It's not as if it's their fault, because water is a scarce commodity there. At least the island is not a barren volcanic rock, like many of the tourist tan-resorts. There is grass to be found, if you look for it, and so is patchy vegetation and things that like this climate such as orange trees and lemon trees, so I hope that puts a bit of balance back into things. 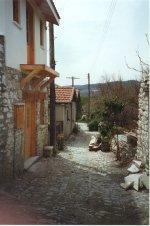 If not, then my piece on Troodos below will provide some balance if you think I've been a touch too harsh! Then there is the island's history to take into account, of course! Few countries can trace this back over 9,000 years, but Cyprus can. The Greeks came to the island relatively recently, only around 3,000 years ago, at the end of the Trojan wars. They were attracted by its strategic position, its copper and its timber. Over the centuries the island came under the sway of various rulers including the Egyptians, Assyrians, Persians, the successors to Alexander the Great and the Romans before Cyprus became part of the Byzantine Empire. Later came the Crusaders, the Lusignans and Venetians, Ottomans and British. (Who'd live somewhere strategic?) Cyprus won its independence in 1960, but the Greek identity of language and culture lives on today. This independence was, in effect, short-lived, when Turkey invaded Cyprus in 1974. Since then, 37% of the island to the north has been illegally occupied by Turkish troops, and a barbed-wire border distinctly separates these two regions of the island. There is no gate through which visitors can pass! The trip to Nicosia from Limassol shows the island's typical face: scrubland with vegetation fighting to keep a hold. But take a diversion into one of the valleys and you enter a local micro-climate. Each is ideal for a particular crop and so has an individual character. Where the micro-climate is not best suited to a crop, the resourceful islanders generally hit upon some other method of making a living, often from handicrafts: such as jewelry-making. 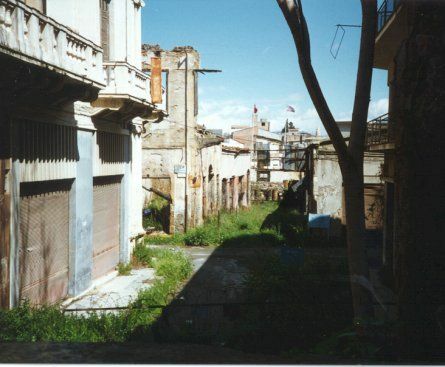 Nicosia, the island's capital, sadly has a no-man's land patrolled by the military running right through its heart. When I visited it before the border was opened to EU citizens, all you could do to glimpse the north was to mount a platform to take a peep, if you felt so inclined. Here's a picture of what I saw. So I can ony talk about the south of the capital. I was very aware of a sadness in the heart of most of the native islanders to the south of this line, since many were unexpectedly forced out of their homes and were not allowed to take anything with them. Whether poor or well-to-do, all became equal when displaced from their homes and possessions. Much credit is due to the authorities for ensuring they all got a roof over their head; I think this was achieved within about two years. Many of these people now live in the (vain) hope of one day returning to their homes. 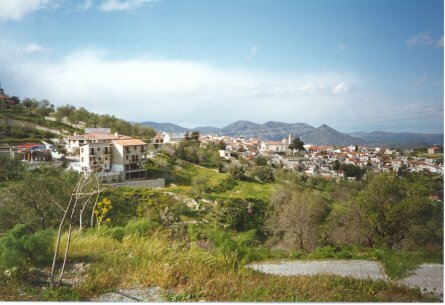 The Troodos mountains offer a great contrast to the usually hot beaches of the Cyprus coast. 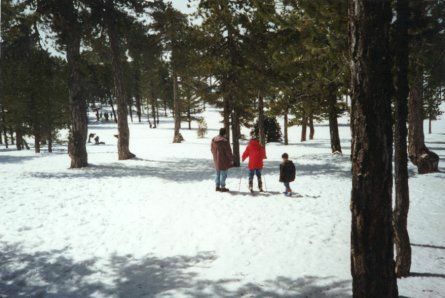 Cool pine forests, glades, interesting rural villages and, at certain times of the year - like when we were there - pure white snow! We took a minibus trip up to the mountains where the snowscape was taken. As you can see, there were skiers at play. What really stuck in my mind about Cyprus - apart from the Roman amphitheatre we visited and all the other interesting sights - was the unspoiled charm of some of the villages. Take the picture to the right, for example. Our pre-booked 'Mediterranean Cruise' was, according to the brochure, to be on a rather fine looking cruise liner (or occasionally her sister ships, as the brochure put it). Don't you just love those phrases: "You'll stay in such-and-such hotel or similar!" So when we arrived at the 'cruise ship' to find that entry was via a car ramp at the stern - maybe the bow, if it was, indeed different - you'll understand that disappointment began to set in. Thankfully we had been a little crafty and had paid a supplement for a larger outside cabin. Call us old-fashioned, but we do like some daylight to filter in from somewhere when on board a ship. It does help a little with the claustrophobia. We were given some slips of paper to identify our cabin when we walked up the entry ramp - which someone promptly took away from us - and then a porter led us to our cabin. True, it was an outer cabin, but it was hard to believe that this was what we had paid extra for. You could imagine a couple of weary truck drivers bedding down in it for a few hours, but it didn't really accord with what we had in mind for our supplement. We were give to expect a four bunk cabin for the two of us, yet there were only two bunks to be seen here. By the time we had recovered from the shock of the tiny cabin, tiny 'bathroom', tiny bunks, the porter had gone. Anyway, not being complainers by nature, we started to change and to try to find somewhere to unpack some stuff, although this seemed a great challenge. I had just discarded my trousers when the cabin door shot open again and another porter armed with bulky cases entered, shortly followed by two more passengers whom, it transpired, had better claim to the cabin (ie they had the correct slips of paper). After a hastily putting my trousers back on - I had the feeling that the rightful lady owner of the cabin would prefer this - the second porter scampered away to try to clarify matters. Needless to say he could hardly understand a word of English - not many of the crew did - so we really didn't know what to expect other than camping down in a passageway or the engine room. We packed our cases again under the piercing scrutiny of the competing passengers who no doubt regarded us as intruders, opportunists, squatters, or perhaps illegal immigrants; they didn't speak English either, so our explanations fell on stony ground. 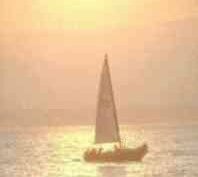 The plan was to sail through Night 1, land in Israel for a day trip on Day 2, sail through Night 2, land in Egypt for a day trip on Day 3, sail through the night back to Cyprus on Night 3. The remaining time on board was spend: a) queuing for breakfast; eating breakfast; queueing to see and maybe pay for photographs taken of every movement both on and off board, queuing for dinner, queueing to see and maybe pay for more photographs taken of every movement both on and off board, queuing for lunch boxes and to get on and off the boat, and, oh yes, enjoying the evening entertainments. The basic choices were bar, casino or floor-show. As a converted car ferry - gosh, didn't I mention that before - it was not as stable as the cruise liner we had optimistically anticipated, and Hazel spent some further time on the second night clutching her stomach and visiting the 'bathroom' to revisit her dinner. I joined some friends to watch the floor show one night and that was quite entertaining: imagine the dancers trying to get a grip of their act as the floor alternately changed from plus to minus 15 degrees, but they took it in good part and stomach, kept the grins plastered across their faces, and did a good job at making it all look quite the normal thing you should expect on a Mediterranean cruise. By the way, I never did see a Captain's Table, let alone visit it! If you enjoyed reading the above article then you will probably also enjoy Belgium by Ed, and Switzerland, also in Europe, and our latest articles covering the Orinoco Delta, La Mata, Marbella and Beijing.